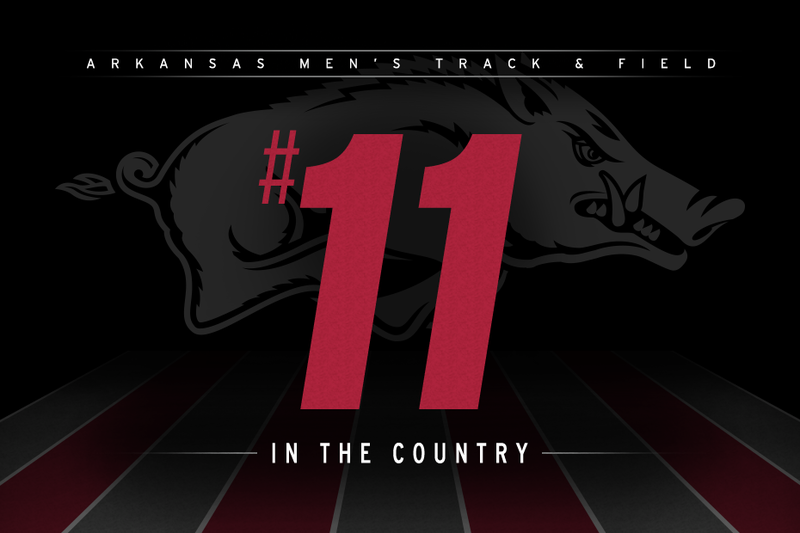 New Orleans – The Arkansas men’s track and field team will open the year as the preseason 11th-ranked team, as the national rankings were released by the USTFCCCA Monday evening. The Razorbacks total 131.63 points which places them just outside of the top-ten. Among returners from last year’s national meet include eight scorers from four events. The Razorbacks, who finished fourth last season, are looking for another podium finish this spring. Fresh off of their indoor meet success, the Razorbacks are expecting contributions from Gabe Moore in the Decathlon and distance specialist Cameron Griffith. Moore finished fifth in the heptathlon in the indoor meet, while Griffith placed third in the 3,000 meters. Arkansas also returns NCAA Champion and senior Kenzo Cotton, who has been a staple in Arkansas’ success in outdoor meets for the past three seasons. The Arkansas men’s track and field team remains in the hunt for its second-consecutive John McDonnell Program of the Year award, sitting currently in second place with 18.5 points. The Razorbacks have finished in the top-three each of the last five seasons. A team receives points based on its finish at each championship event (i.e. first = 1 point, 10th = 10 points) and the points are added together with each passing season. The team with the lowest score following the completion of the NCAA Outdoor Championships is determined the winner. Head coach Chris Bucknam returns several All-Americans from last year’s championships season including one of the NCAA’s best sprinters in Cotton. Bucknam’s squad remains steadfast in their national title mission and with a roster riddled with young talent and veteran contributors, the Razorbacks look to make a statement this spring. In the hunt for its second conference title in three season, Arkansas will face a loaded field that includes eight addition top-25 conference programs. The Razorbacks will make their outdoor debut at the Arkansas Spring Invitational in Fayetteville, Arkansas, on March 23-24 at John McDonnell Field. Season tickets are available online, contacting the Razorback Athletics Ticket Center at 800-982-HOGS, or visiting in person. The Ticket Center is located just east of Baum Stadium at 1295 S. Razorback Road in Fayetteville.